If you are looking for an elegant nautical-themed award for your next event, the Sapphire Sailboat Crystal Award is your solution! 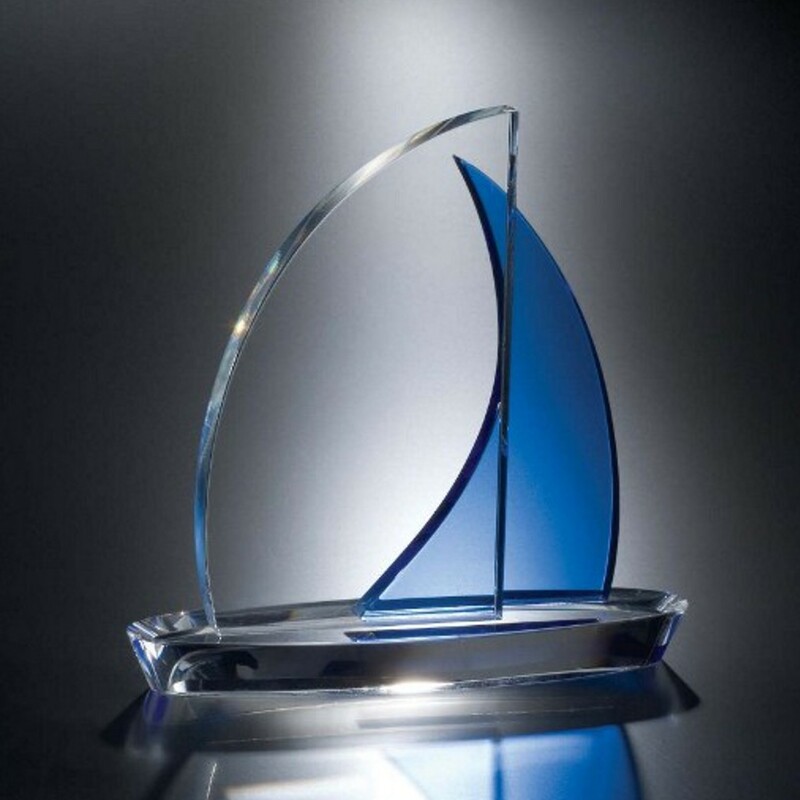 Created by the Toujours company, this 8 inch tall designer award is crafted from solid crystal and features a sapphire blue accent sail. This award includes free engraving of 6 lines of text and logos. Add some excitement to the award shelf of your winning employee with this trophy! Production time for this product is 3 business day(s); expected pickup or shipping date is 05-01-2019. Ordering More then 100 Click Here For Large Order Quote! We ship via FedEx to all 50 states. To accommodate our military families, we also ship to APO/FPO addresses by USPS Priority Mail. Each product has an engraving template that will appear when the Customize button is clicked. It is not necessary to use all engraving lines in the template. Regardless of the number of lines you enter, we will make sure that the engraving is centered and looks professional. We recommend 25-30 characters per line for most trophies. Other items such as plaques or acrylics can accommodate a varying number of characters depending on the award size. We will choose appropriate fonts and spacing. Our automated system imports your engraving text directly into our engraving machines so please check it over carefully as you enter it. If you would like the opportunity to review your engraving layout prior to production, you can make this request when you proceed to checkout and check the box indicating you would like to receive a proof. Our production time is usually between 2-7 business days but varies with each specific product and our inventory levels. Production time will be added to shipping time for the Guaranteed Arrival dates that are presented during checkout. If you are a professional graphics designer and would like a template or dimensions for a particular item, please email [email protected] with your request. Please include the product number(s) and any other pertinent information.